The first official teaser trailer for Game of Thrones season eight has arrived, and it tells us everything and nothing about what to expect, which feels appropriate since the extremely popular series has often kept us in the dark until it was the right time to reveal certain truths to tell its tale. In the closest approximation to its source material, George R.R. Martin’s A Song of Ice and Fire book series, the first season eight trailer shows fire and ice crawling over parts of a map of Westeros before meeting in what’s likely a symbolic vision of the impending battle between Jon Snow, Daenerys Targaryen and the Lannisters. Although we don’t actually see any of the beloved Game of Thrones characters in this trailer, we do see the 3-D animated map of Westeros that has featured in every title sequence across the series’ previous seven seasons. This time, however, it’s different: the 40-second clip begins with ice crawling over the northern part of the map. Then, we see fire crawling over the southern part. Ice encapsulates a direwolf, the Stark family sigil, and a dragon, the Targaryen family sigil. 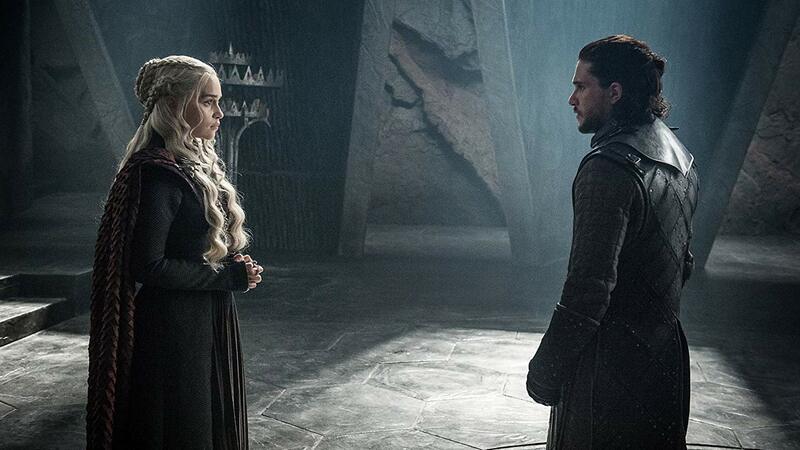 This may or may not point to Jon Snow’s and Daenerys Targaryen’s relationship, which took a romantic turn at the end of season seven (and which will undoubtedly get complicated when they learn they’re closely related). Meanwhile, fire encapsulates a lion, which is the Lannister family sigil and undoubtedly a reference to the coming war landing on Cersei and Jamie Lannister’s doorstep in King’s Landing. We gather from the trailer that the Lannisters will fall to the overwhelming and literal firepower of Dany’s two living dragons (“With fire and blood” are the Targaryen house words, after all), although the slow creep of ice across so much of the map also suggests that the Starks will prevail, whether it’s by aligning with Daenerys, being well suited to surviving the harsh winter because they’ve lived in the north for their entire lives, or both. If Daenerys maintains her alliance with Jon and his Stark siblings, that could be good for her, but the battle for Westeros has certainly never been easy. What the trailer doesn’t tell us is what to expect when it comes to the undead army that has broken through the Wall in the north and is making its way south — perhaps the biggest threat to everyone, regardless of who is squaring off against each other. The only thing we know for sure from this brief teaser trailer is that Game of Thrones will return in April 2019, though HBO previously confirmed that with a montage trailer of old Thrones clips that was released in November. That is to say, this trailer has given us lots of interesting new information without confirming any of it, and we’re on the furthest edge of our seats.